Stand out from the crowd and boost your page performance with Somerville WordPress theme. This bit unusual theme with modern flavor is optimized, coded with site performance in mind and brings full support for all native WordPress functionalities. Theme is compatible with Gutenberg plugin which is a whole new way to use WordPress. Publishing experience has been rebuilt for media rich pages and posts and you can enjoy the flexibility that blocks will bring. Very good performance rankings are possible thanks to complex theme optimization, but you can still extend functionality easily; lean and valid source code guarantees great plugin support and compatibility. 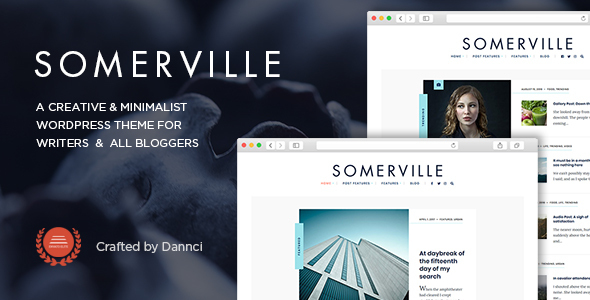 Somerville is a premium easy-to-use WordPress theme developed specifically for personal, streamlined blog websites. The theme is modern and brings minimalist feeling to your WordPress blog. Our theme comes with three main layouts (left sidebar, right sidebar and without sidebar) and with a fully responsive design. You will receive a detailed documentation along with additional features like unlimited color schemes, countless Google webfonts, custom widgets etc. Blocks are a great new tool for building engaging content. With blocks, you can insert, rearrange, and style multimedia content with very little technical knowledge. Instead of using custom code, you can add a block and focus on your content.